AMK (Aka Anthony Michael King) collaboration with Willie Sarate. 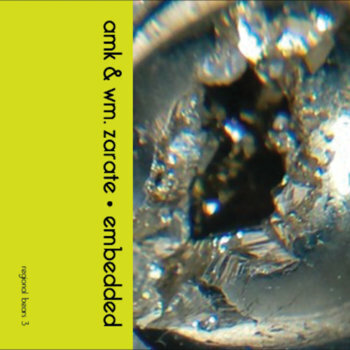 AMK is a sound artist from Los Angeles, CA, active since 1984. He is the founder of Banned Productions label, releasing albums by The Haters, blackhumour, Merzbow. WM Zarate is a new name to me. Their collaboration is a noise sound collage, mixing flexi-disc montages, turntable noise & field recordings, constructing a rich and complex noise music. Listeners that in to The New Blockaders works and focus to experimental noise aesthetics this is a recommended release.